Usually you can get an idea of what the game is like at least pertially from the title. Great Secrets: Nostradamus uses a big name, and is supposed to be full of mysteries, great events, prophecies and other things like that, but it actually isn't. The game turns out to be very peaceful and with little action. Though it is full of challenging tasks for you to accomplish. The conversations usually happen between you and Leonardo Da Vinci. You play as a young Nostradamus. He became aware of the strange gift - or curse, that he'd been given. He can't understand what to do with the visions that he occasionly gets. After his mom's advice he started a journal. The journal is one of the ways you get parts of the story behind the game. You also learn a lot of what's going on through the conversations, through many conversations. Most of them are just empty chatting, like "I'm not sure what to do with the visions that I get", - "Don't worry and don't tell too many people about it. And clean my worshop as a stress relief." 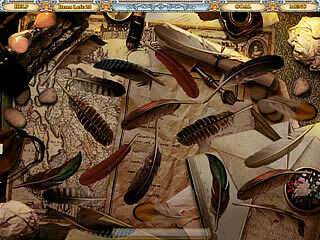 Something like that takes you to the hidden object level. The conversations usually happen between you and Leonardo Da Vinci. The is like a mentor for you giving advice and sharing some of his knowledge. Some interesting facts about him and other famous people you meet are recorded in the journal that you keep. The general atmosphere of the game is very peaceful and slowly going. Da Vinci looks and sounds like a loving grandpa. The graphics are not impressive, but rather good, and the music is nice and beautiful. 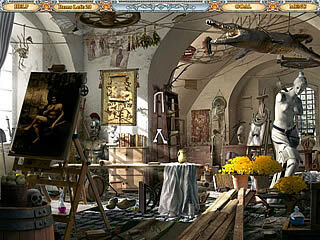 The hidden object scenes are not clattered with modern stuff. Though there are other problems with them. Some of them just don't show the items that distinctively. It seems sometimes that most of the items are of similar colors and it is hard to see some of them even when they are not tiny. The searches go in a classic way - you get a list of items to find and you do that by clicking on them. There are hints available for you after they recharge. There are two modes in the game. The average one doesn't limit you in time for completing levels and doesn't punish you for random clicking, while the advanced one does. 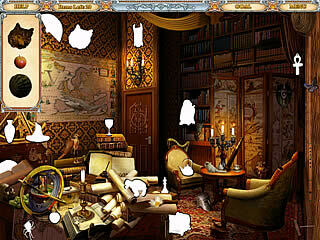 Apart from the hidden object levels there are also many puzzles for you to solve. Most of them are very typical and the ones that you've seen and played before, like connecting the pipes or putting together a jigsaw puzzle. All of them are connected with the story and the character that you meet. The game will not shock anyone who's been into the genre for quite a while with the puzzles and ideas you come across, but it might be a good enough time-waster while waiting for something more impressive. As always, the trial version will be a great help in making your mind about the game. I have been playing The End today. I'm very inttsereed in attitudes towards death & I enjoyed all the features, especially the Death Map. I cannot wait to see more of your work. This is Great Secrets: Nostradamus review. Download this game here.